Wandering into an enchanted forest, a very lonely garden Gnome finds itself surrounded by succulent mushrooms... the mushrooms are not alone though. Roaming this enchanted forest, the Gnome discovers the ruler of this magic land: the ravenous Centipede! Armed only with its wits and trusty magic wand, the little Gnome must beast back the advancing Centipede and its army of beastly bugs! 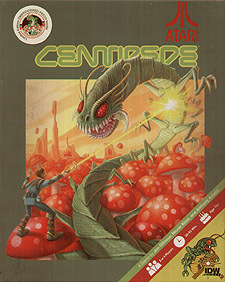 In Atari's Centipede, 2 or 4 players venture into the world of the classic Atari arcade game. On one side, a Player controls the Gnome, exploring the forest and trying to defeat the Centipede. On the other side, the Centipede Player, eager to destroy the Gnome, must wiggle their way to the other end of the board. The Gnome Player rolls and spends their dice to perform actions, while the centipede Player uses a deck of cards to spawn Fleas, Spiders, and Mushrooms, trying to control the game board. The first Player to eliminate their opponent wins the game!